With a need to provide a more direct route to the North West of England, the Trent Valley Line was built and opened in 1847. Construction started in November 1845 marked with a ceremonial sod-cutting at Tamworth by Sir Robert Peel on 13 November. 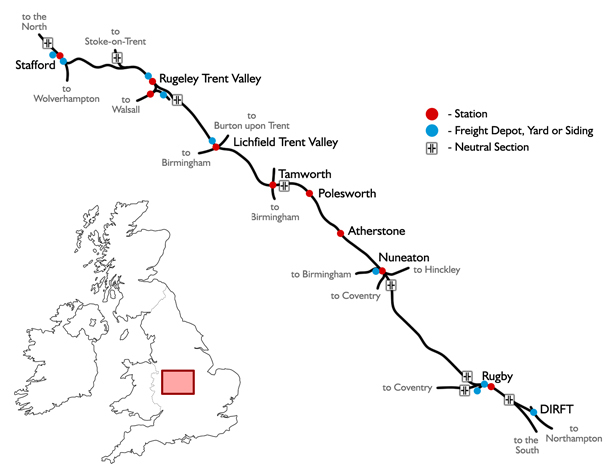 The Trent Valley Line was opened during 1847 and now forms part of what is called the West Coast Main Line (WCML). The line was electrified during the 1960s to the 25kV AC system. As one of the earlier routes to be energised it features "Mk1" catenary equipment which utilises heavier engineered portal structures compared with later, more modern systems. During modernisation of the route between 2004 and 2008 the catenary was upgraded by replacing many of components mounted to the existing portals (this is now referred to as "UK1" equipment). At a cost of around £350 million, Network Rail has carried out significant upgrading of the route. Prior to 2004 the Trent Valley section of the West Coast Main Line had an 11 mile (18 km) long section of track between Tamworth and Armitage that was only double track. With plans to accommodate the new and faster Pendolino trains it became clear that this could not be done in parallel with the existing slower local services. The solution was to increase the number of tracks between Armitage and Tamworth. This upgrade provides four tracks throughout the route from Nuneaton to Colwich Junction. Work started in 2004 with the need for substantial civil engineering works including bridge replacement and removal of level crossings at Hademore. The new four track section was commissioned in 2008. Additional works were carried out between Rugby and Brinklow. This increased the existing three tracks to four. The main bottleneck that remains on the route is the 2 mile long section of double track north of Colwich Junction that passes through Shugborough Tunnel. During the modernisation project the whole of the Trent Valley line was resignalled with a large number of new signal gantries being erected and provision being made for bi-directional running on a large proportion of the main line. As part of a nationwide project to free up space on the network a new rail chord was built north of Nuneaton station and opened to traffic late in 2012. The new chord allows northbound freight traffic to travel through Nuneaton station without blocking passenger service routing on the main line. This is part of a wider programme to create a route for larger 9'6" containers between the port of Felixstowe and the Midlands, North West of England and central Scotland. Highly detail trackside models including high speed point motors, catch pits, drains, cable trunking, elevated trunking, elevated circuit cabinet platforms, signal access walkways etc.